I know I said I was swearing off psychological thrillers. But I went to the Editors’ Buzz Fiction session at BEA, and the Simon and Schuster editor promoting Unraveling Oliver by Liz Nugent was so passionate about it, and the story sounded interesting, and then I almost got trampled trying to get my paws on a copy of it, so I decided to read it. It is a psychological thriller, a genre I have compared to popcorn for its irresistibility, quick intake and vaguely sickening aftereffect. 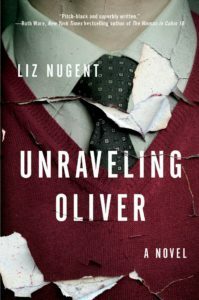 But Unraveling Oliver is a notch above most of the other thrillers I’ve read. It’s about a children’s book author, Oliver, who has just beaten his wife so badly that she is in a coma. What would move this man to do such a thing? Nugent unravels Oliver’s life from the present back to his childhood to get at what caused him to attack his gentle, loving wife so monstrously. The story is told from multiple perspectives, providing a range of interpretations of and opinions about the title character. There are a few twists and turns, including one that made me gasp so loudly that my husband asked me what was wrong. Just when you think you understand Oliver, Nugent peels back another layer that reveals even more egregious behavior. I don’t want to say too much more. If you’re looking for a book that you will have trouble putting down (but that won’t scare you half to death) then this is a good one. You won’t be thinking about it for days on end, but you’ll enjoy the ride while it lasts.